Tru Burger is hands down the most casual of the new burger joints to pop up in New Orleans. It’s not fussy or frilly and feels like a throwback burger joint — complete with shakes, but without the cheesy burger joint hats. Normally, I immediately recommend the burgers. 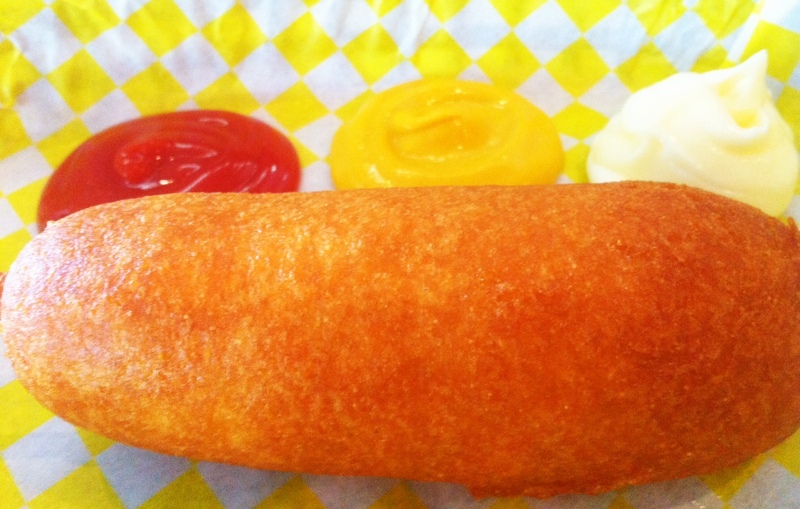 But I have to give proper service to Tru Burger’s corn dog. It’s hand-dipped in a batter that fries to a cakey texture that’s moist and crispy all at once. I like my corn dogs with mayo, something some people say is odd, but I’ve liked it since I was a kid. Anyway, all I can say about this corn dog is that it’s the best corn dog I’ve had outside of the ones at the State Fair of Texas. And that’s a huge compliment. Onto the burgers. 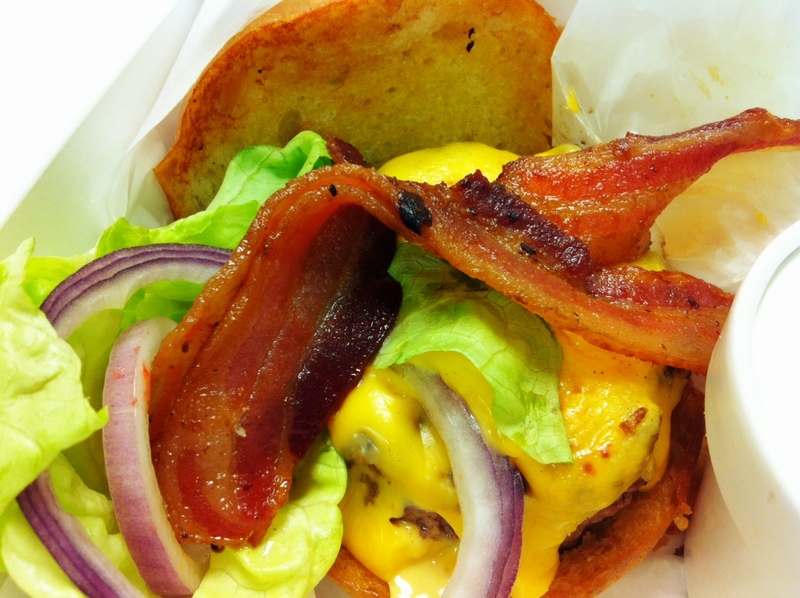 The burgers at Tru Burger are fairly simple and a nice size, not too big, not to small. All of the burgers are cooked to medium, but you can specify the temp you want your meat cook to. I usually go for medium rare. 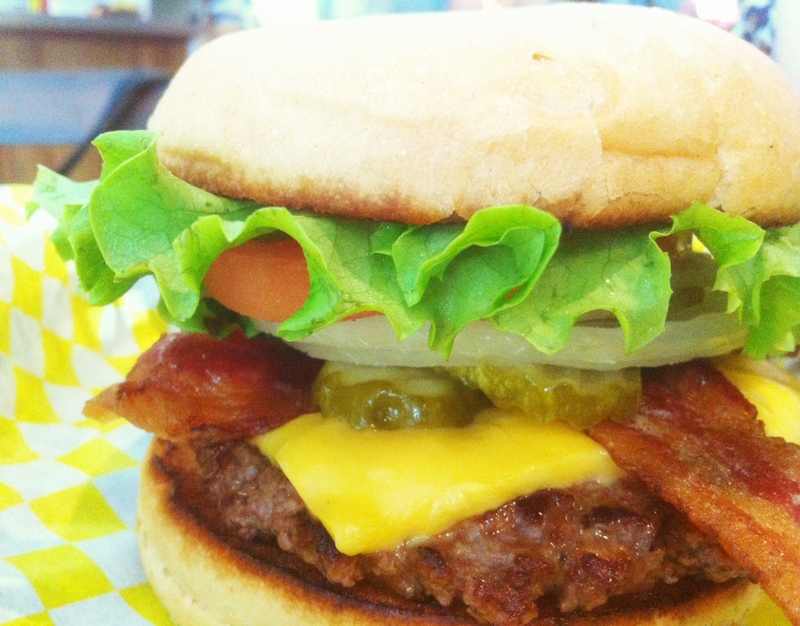 All the patties at Tru Burger are 100% Creekstone Angus and ground in-house. The buns have a nice texture and basically melt in your mouth which is a nice effect and something I’m not used to in a hamburger bun. One of my favorite burgers is the Charlie Burger. It’s served with bacon, Swiss cheese and coleslaw. I add Sriracha to give it some heat which contrasts nicely with the coolness of the coleslaw. On some visits, the Swiss cheese doesn’t melt on the burger which I think takes away something from the burger as a whole. But overall, this is a great choice. The Tru Burger itself if also a good choice. It’s a simple burger with your choice of cheese loaded up with onion, tomato, lettuce and pickles. The pickles alone are reason for ordering this burger. While it’s simple, it works. It’s a good, if not outstanding, burger. The fries are thin and crispy. I think they’re some of the best fries in town. The sea salt crystals give them just the right amount of saltiness to balance the earthiness of the potatoes. I find the shakes at Tru Burger a little underwhelming. I do like that they’re served with bubble tea straws so you don’t have to battle the cup for who wins the shake. But that said, the shakes I’ve gotten have been just okay tastewise. I’ve also had some shakes with ice crystals in it which I’m not a fan of. 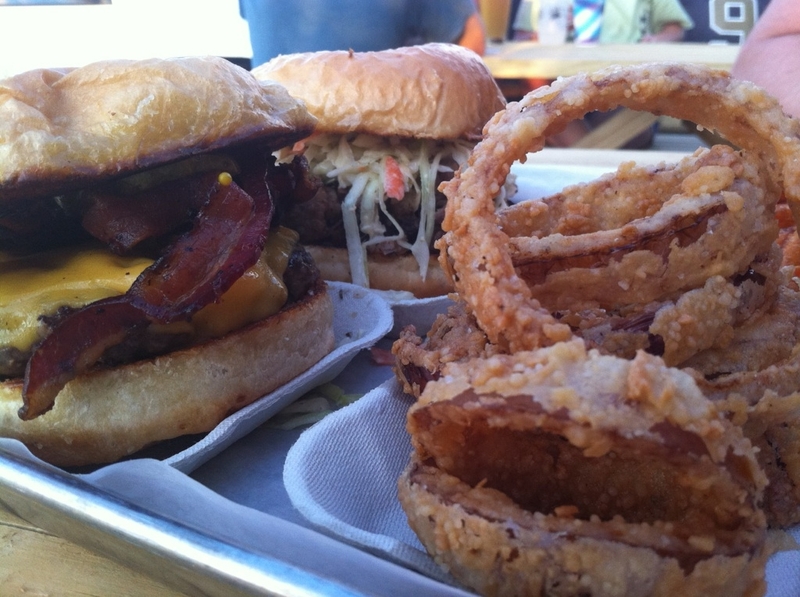 Overall, Tru Burger is a solid choice for burgers in New Orleans. I see it on the fringe of upscale burger joints. It’s more suited for families, drop-ins and quick cravings for a burger. Tru Burger is located at 8115 Oak Street. Tru Burger is open Tues. through Thurs. 11 a.m. to 9 p.m., Fri. and Sat. from 11 a.m. to 10 p.m. and Sun. from 11 a.m. to 8 p.m. I think I visited Cowbell for the first time early in 2011. From the first bite, I knew it would be a place I frequented often. So it came as no surprise to me when Cowbell was named The Gambit’s Best New Restaurant (as selected by readers). The burger craze is in full swing in New Orleans, but out of all the burger joints (old and new), Cowbell is hands down my favorite. The beef is always juicy and cooked perfectly. 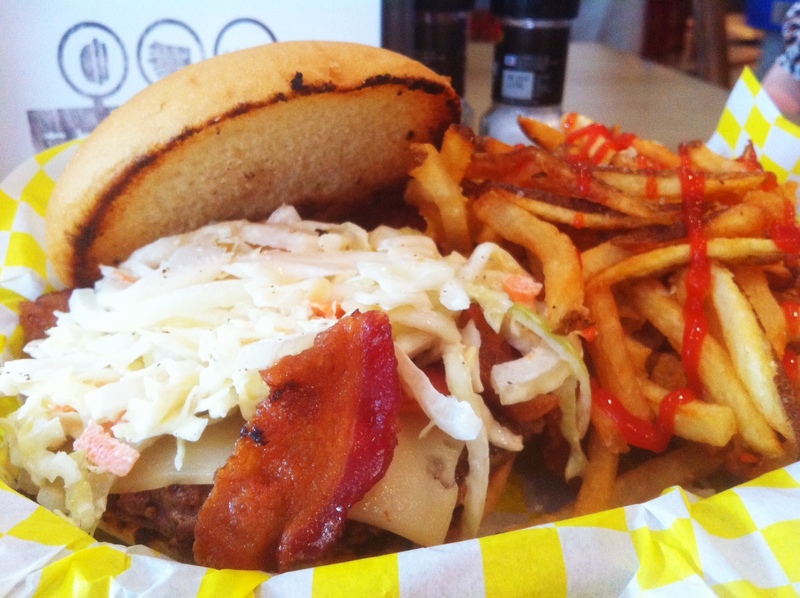 Add American cheese, bacon, a yard egg and Cowbell’s homemade Mojo sauce and you’ll be transported to burger heaven. The burger with zinfandel, bacon and onion compote can take you there as well — it’s just a different journey. The Cowbell burger is so good, it makes it hard for me to order anything else off of the menu. Fortunately, I break the habit and order other items from time to time. One of the best I had was a salmon special with black beans and avocado. The waitress (who knows me well by now) recommended and was spot on (as usual). Her name’s Tarani, you should ask for her if/when you go in though she seems to be behind the bar most of the time these days. Additionally, you can’t go wrong with any of Cowbell’s grilled cheese sandwiches that seem to change daily. The Fried Oyster Salad is also delicious when oysters are in season. The Fish Tacos are good, not great, but will do the trick. But admit it, what you really want is the burger. I know, I’m the same way. A lot of my love for the Cowbell burger comes from the meat itself, but the potato bun should be given some of the credit. And if you think I’m crazy for getting the egg, try it yourself, you won’t be disappointed. 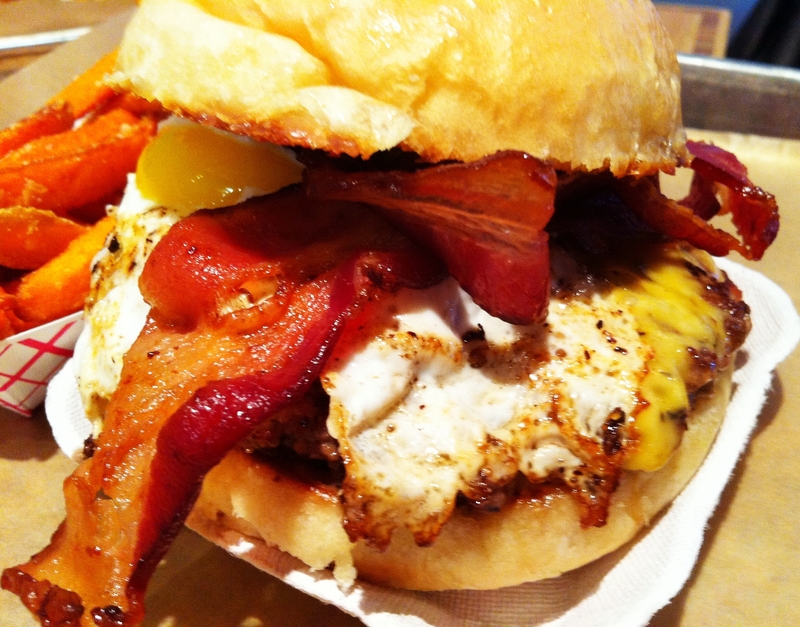 The yolk from the egg will burst and soak into the potato bun given the burger a whole new flavor profile. You can even sop up the yolk overflow with the hand-cut fries that are always crisped and seasoned just right. Or you can always substitute (for an extra charge) Cowbell’s kickass Mac and Cheese in place of the fries. 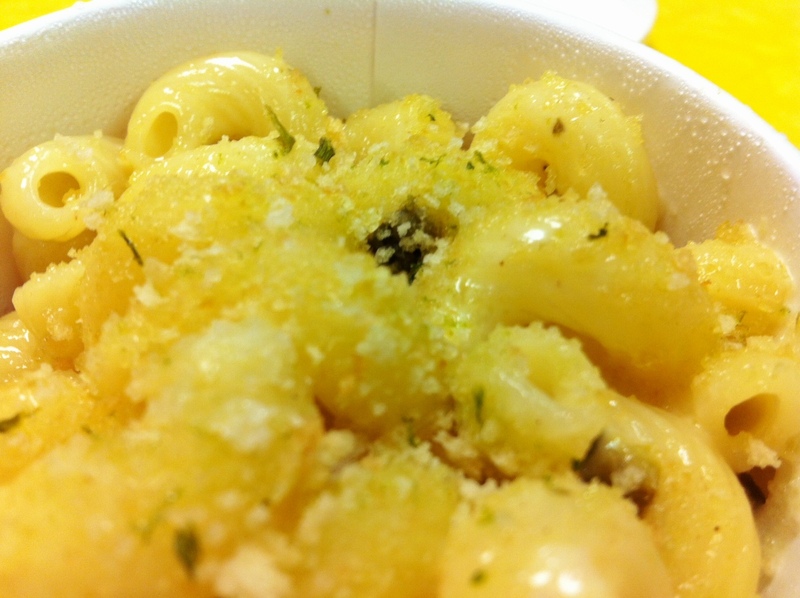 Their Mac and Cheese is made with white cheddar and roasted poblano peppers. It’s creamy, has a subtle kick and is filling. Another thing you won’t want to leave without is the Fresh Made Apple Pie. It’s baked individually into a puff pastry, but it’s worth every bite and for $5 it’s a steal. Cowbell used to by BYOB, but now that they have a liquor license it’s $5 for the first bottle you bring and $10 for each after that. Most of the drinks they have are of a nice portion and they have one of the best margaritas in town, surprisingly enough. Cowbell is 100% deserving of winning Gambit’s Best New Restaurant. You may experience a little bit of a wait now that it’s on people’s radar. Service is normally great (like I said, ask for Tarani), but there’s one lady who I would avoid. You’ll know her if you get her. Simply put, she’s just not friendly. Thankfully, the food more than makes up for it. And Brack May, the owner, couldn’t be a nicer guy. Invite him over to your table if he’s around. Cowbell is located at the intersection of Oak St. and River Rd. at 8801 Oak St. Hour are Tues. through Sun. 11:30 a.m to 3 p.m. and 5 p.m. to 11 p.m. The burger craze is in full effect in New Orleans and the newest burger joint on the block is The Company Burger. Serving burgers, sides and beer is a pretty much fool-proof concept, but The Company Burger’s concept is not only fool-proof, but genius. In my visits to The Company Burger I’ve tried just about everything. My favorite? The Turkey Burger. Yes, that may sound weird and health-conscious, but it’s the best turkey burger I’ve ever had. The patty is thin and juicy, but the tomato jam, green goddess dressing and arugula it comes standard with really push it over the top. I could eat one every day and die happy. The Lamb Burger is also a solid choice, but falls just short of the Turkey Burger and the Company Burger if you ask me. However, The Company Burger’s biggest seller is its antibiotic/hormone-free beef patty burgers. The only items complementing the beef patty? Red onions, American cheese and housemade bread and butter pickles. It’s simple, it’s grilled to perfection and it’s full of flavor. I can usually never resist adding bacon and a yard egg to mine. There’s nothing better than an egg yolk bursting in a burger and creating a rich, makeshift sauce. Speaking of sauces, I would be remiss if I didn’t mention the mayo bar at The Company Burger. All of the mayos are made fresh daily and there’s a mayo for every tastebud. The Basil Mayo is the best in my opinion. Especially when you dip the Sweet Potato Fries in it. I also like making my own Sriracha mayo which is something I wish they would add. The Company Burger also offers Baconnaise, but I have to admit, I wasn’t a big fan. It was too sweet. The best part is that you can mix, match and sample as much as you want so the mayo combos are endless. The sides at The Company Burger are just as well done as the burgers. 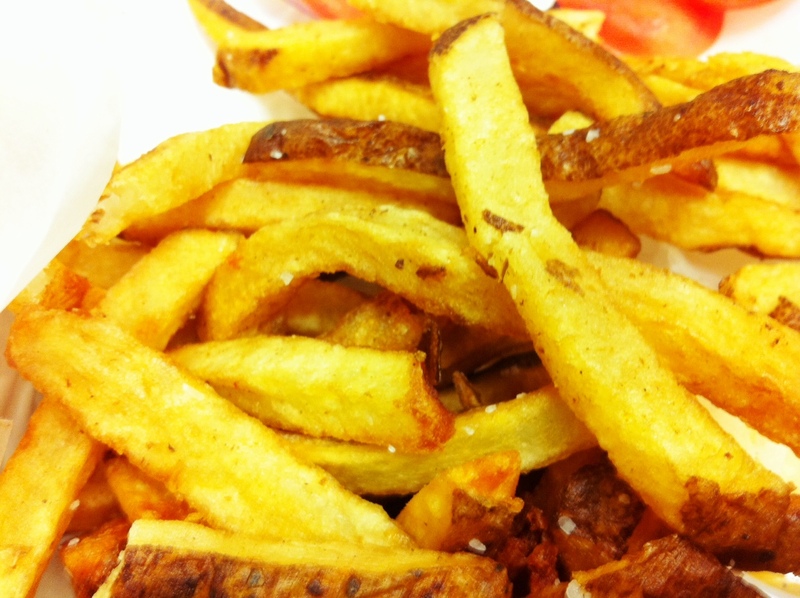 The Company Fries are handcut fries that always come out crispy and salted just right. Plus, the skin is left on which is always something I enjoy in a fry. The Sweet Potato Fries and Tater Tots are also great choices. As for the Onion Rings, they rank in the top three for onion rings I’ve ever had. Made with red onions, the batter and the sweetness of the red onion combine amazingly to create a heavenly onion ring. On one visit, I was fortunate enough to sample the Brisket Sandwich. It was so great, I’m thoroughly disappointed it was a special. It held its own against most briskets I’ve had in Texas, and Texas is serious about brisket. The homemade cole slaw and brisket were an example of crunch, sweetness, saltiness and meatiness. On second thought, I’m glad it was a special because it would be trouble for my belly if it was a regular item. The Company Burger has a great beer and cocktail selection that seems to be continuously expanding. Local beers and other beers from all over the country are available. 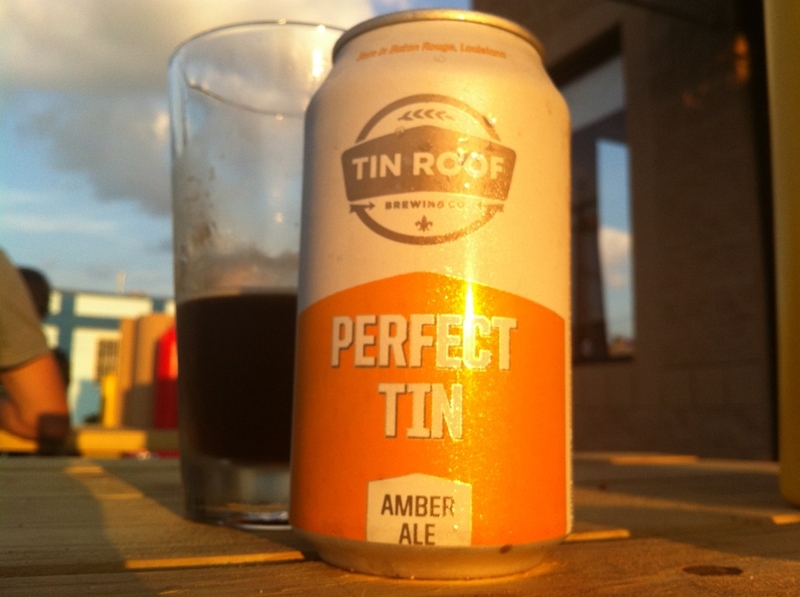 I really enjoyed the Tin Roof I had on a recent visit. The cocktails are also meticulously crafted and worth sipping on. If you still have room for dessert, The Company Burger has some very decadent brownies which are probably best split. There’s also a Carrot Cake, but I’ve yet to try it. I usually don’t have room for dessert after scarfing down my burger and fries. The Company Burger is the perfect example of a neighborhood burger joint sticking to burger roots, but experimenting enough to please consumers from all aspects of life. This is a great place to bring anyone because if they can’t find something worth eating on the menu, there’s something wrong with them, not the restaurant. The Company Burger is located at 4600 Freret St. and is open daily (with the exception of Tuesdays) from 11 a.m. to 3 p.m. and from 5 p.m. to 10 p.m.
Waffles. Fries. Two things pretty much irresistible to a food. So when I heard of Saus, a place in Boston specializing in both, I had to visit. 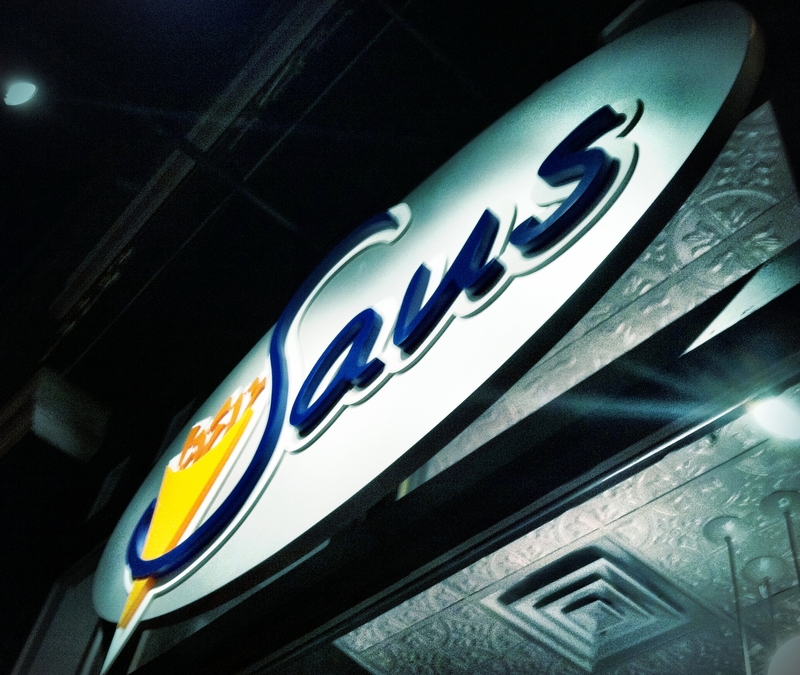 Saus is located just steps from Quincy Market so it should benefit from a lot of foot traffic. When my friend and I went it was empty so we had plenty of time to peruse the menu and decide what we wanted. We ordered a regular-sized order of fries to split. 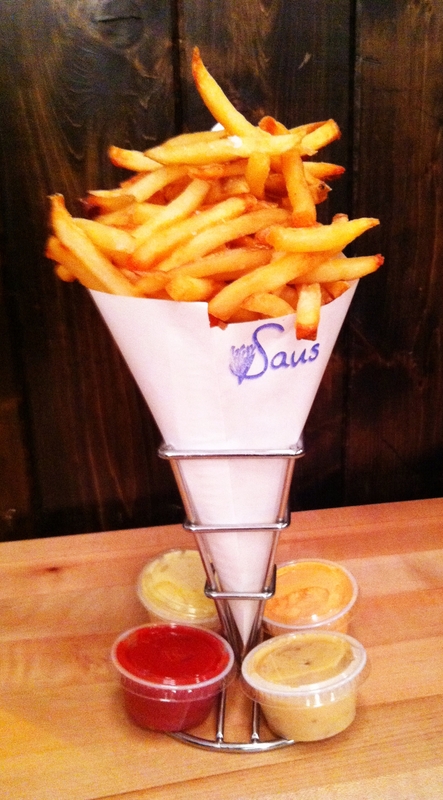 In addition to the fries, Saus offers roughly 15 to 20 dipping sauces. We decided to try four: Bacon Parm (bacon and parmesan), Samurai Sauce (Sriracha mayo), Truffle Ketchup and Vampire Slayer (roasted garlic mayo). All of the fries and waffles are made to order, so once we placed our order, the potatoes went into the fryer. They came out hot, golden and crispy. Were they the best fries I’ve ever had? Probably not, but they were still worth ordering. What really made the difference is the sauces. It’s clear to me that the brains behind Saus took the time to test sauces in deciding what would pair with fries. My two favorite sauces of the night were the Samurai and the Bacon Parm, but they were all good. After most of our fries were out of the way, our waffles came out piping hot. Saus offers four different waffle toppings (Salted Caramel, Homemade Nutella, Lemon Cream and Berry Berry) and a seasonal topping (when I visited it was Harvest Apple). Since we ordered two waffles, we chose Salted Caramel and the Homemade Nutella. 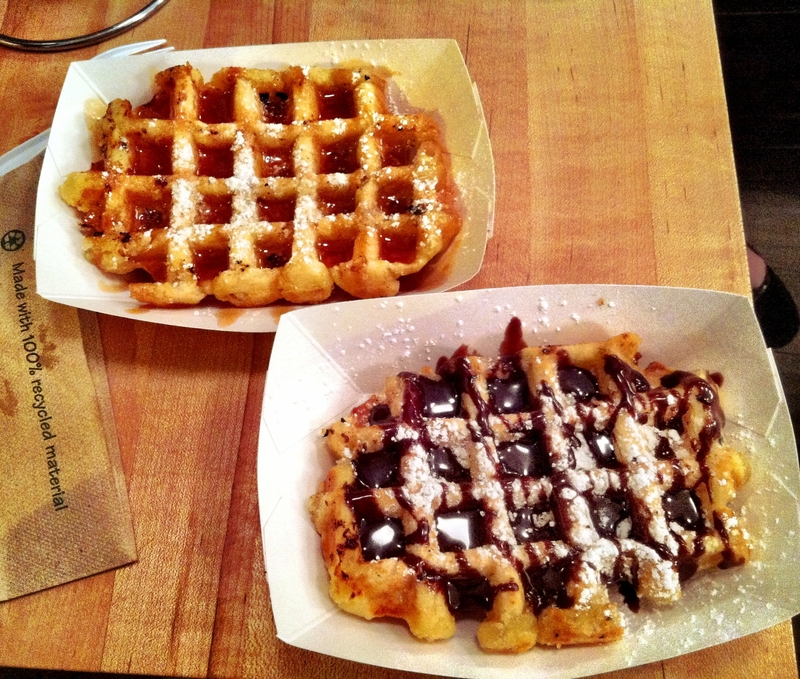 What makes Saus’ waffles insanely delicious is the fact that they use pearl sugar. It really gives the waffles a nice crunch that doesn’t just come from the golden brown waffle itself. The Homemade Nutella waffle was quite tasty, but Saus’ Nutella has nothing on the real thing. It doesn’t have quite the same chocolate/hazelnut ratio or the consistency of Nutella. I will say that the Salted Caramel waffle is one of the best waffles I’ve ever had (sorry, Waffle House Pecan Waffle). The sweet/salty flavor profile has always been one of my favorites and Saus’ salted caramel topping is perfection. One of my biggest pet peeves is when salted caramel isn’t right. Thankfully, Saus got it 100% right. To me, Saus is street food under a roof. But it’s damn good street food. They have late night hours on the weekend and I can’t imagine the fries and waffles don’t make for some great drunk food. I enjoyed my trip to Saus so much, I wanted to go back, but ran out of time. Add it to your list next time you’re in Boston, it’s already on mine…again. Saus is steps away from Boston’s Quincy Market at 33 Union Street. The hours vary so visit Saus’ website for details.